The sweltering summer months have definitely hit here in St. Louis, and I don't know about you, but my appetite dwindles and my craving for cold drinks skyrockets when the heat and humidity hit. 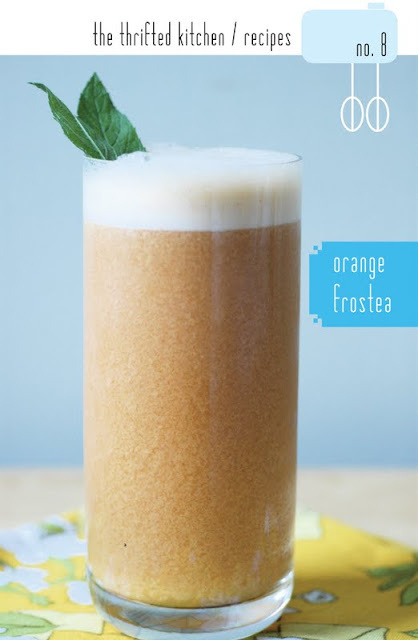 So this week I'm excited to (finally) branch out from baked goods and introduce you to a drink that will cool you down over the next several months: orange frostea. 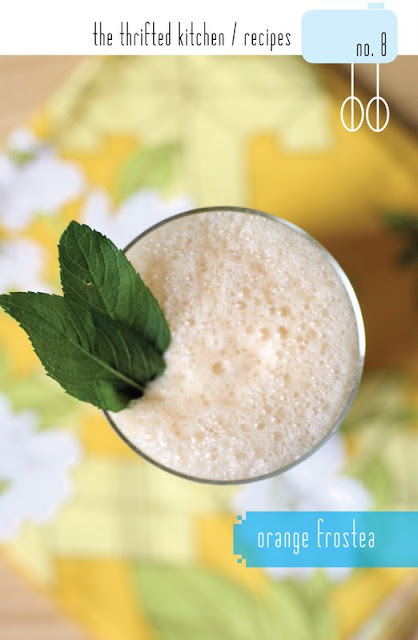 Mix tea, orange juice (just as it comes from the container) and sherbert in a blender or shaker. Serve in tall glasses. The end! Short & (literally) sweet! Well, we have a Cuisinart hand blender that was a wedding present. It's seriously amazing (comes with a blender, whisk and chopper attachment) and you can blend in any container you want instead of everything having to fit in a blender. But if you don't want to buy something like that, you could get the same result from whisking, I would say. Just as long as the lemonade and the sherbert are malleable enough! Writing the tips down, thank you!